Whether or not you were born by the 90s, you’ve no doubt grown to love the classic Toy Story movies. Created and produced by Disney and Pixar, the Toy Story movies are a series of animated films that are incredibly popular with both kids and adults alike. The first Toy Story movie tells the tale of a group of toys that live in their owner’s room and come to life when no one’s watching. Aside from the main characters that include Woody and Buzz Lightyear, there are also famous toys like Jessie the Cowgirl, Bo Peep, Cowgirl, Ham, Rex, the three-eyed Aliens and the Green Army Men. 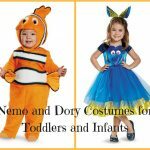 Your child will be able to reach for the sky and fly to infinity and beyond for many hours of make-believe in Toy Story costumes. As the leading character and protagonist of the Toy Story series franchise, Woody is portrayed as a stuffed, do-gooder cowboy and Andy’s favorite toy. Woody leads all the other toys on great, dangerous, hilarious and outright exhilarating adventures. He’s characterized by his brown cowboy hat, yellow shirt, cowhide vest-jacket, blue pants and big, jingling cowboy boots. 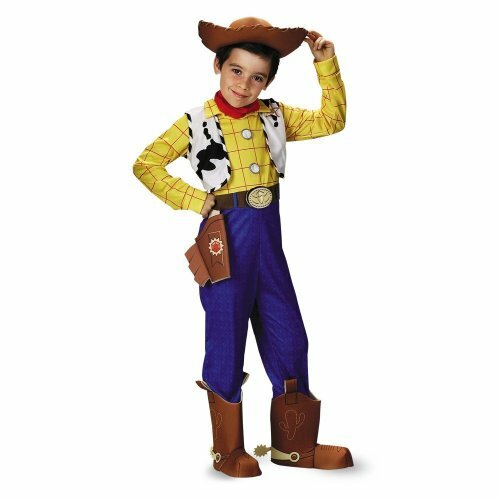 Made from 100 % polyester exclusive of the trim, the Toy Story 2 Woody Costume features a full bodysuit with an attached vest and holster. There’s also a pair of brown boot spats with spurs, a cowboy hat, and the classic red bandana to finish off the look. A wise man once said that you’re never too young to become a cowboy. 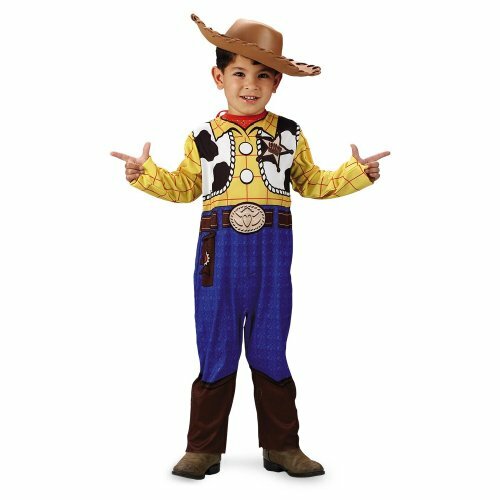 With this costume, your child will be able to lasso in some fun without any worries. 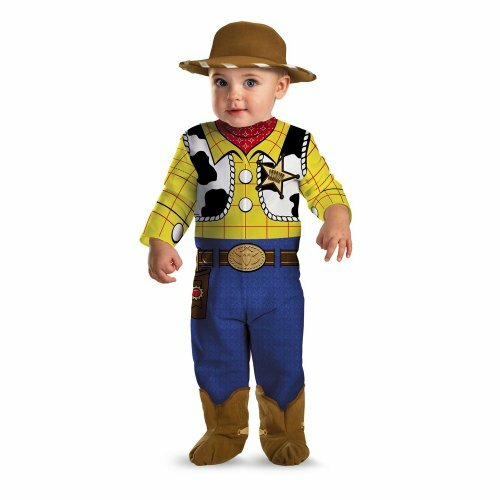 But the Woody Classic Child Costume gear is not your average costume. 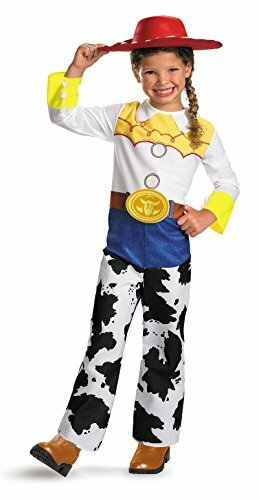 With its printed cowboy jumpsuit hat and a comfortable, safe bodysuit with all of Woody’s elements printed on, this is the best option for toddlers, infants, and small kids. So, what do you do when your small, cute baby just can’t get enough of their favorite character in Toy Story? 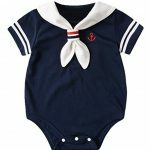 Simple, you get them an extremely detailed onesie that is as comfortable s it is attractive. 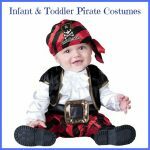 The Disguise Baby Boy’s costume features a vibrantly printed onesie with all the elements and a separate, baby-sized cowboy hat and pair of booties. Who says that you have to go out as your favorite Toy Story character only on Halloween? 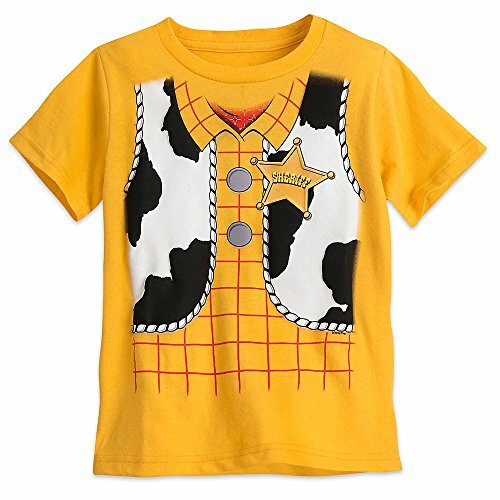 With the Disney Woody Costume Tee for Boys, your little ones can wear woody every day of the week. The costume features a yellow T-shirt with Woody’s classic shirt print and cowhide vest printed on. Every story needs a futuristic hero, and in Toy Story, that’s Buzz Lightyear. According to the movie franchise, Buzz is a bold, brave and modern toy space ranger and also an action figure whose primary mission is to save mankind. Next to his main man Woody, Buzz is one of the two lead characters in the Toy Story franchise. 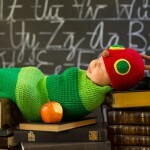 Are you looking for the softest and most comfortable Buzz Lightyear costume for your toddler? This green, black and white one-piece features all the fancy detailing that the original buzz. And the best part is, it’s light, easy to wear and super affordable. 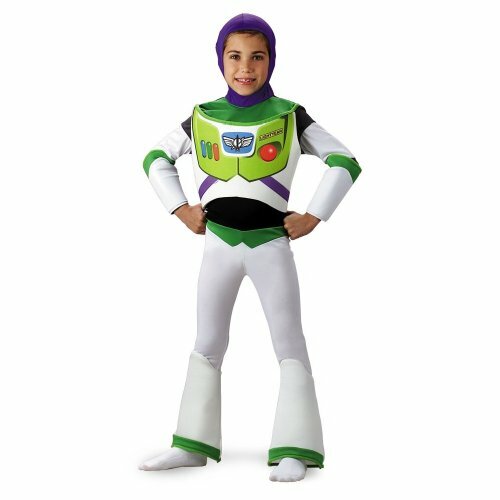 Being Buzz never looked so convincing until they licensed the Buzz Lightyear Deluxe costume. 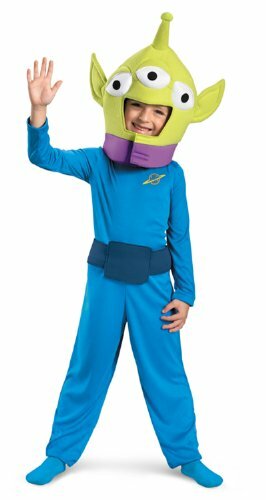 This futuristic, modern, well-molded jumpsuit is made from 100% polyester and even includes the character hood, a cool attached chest piece and a pair of elongated shin guards. 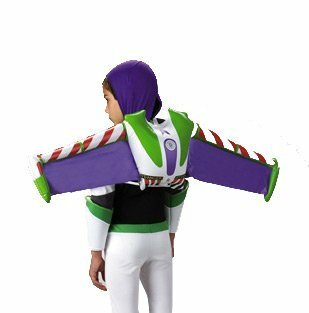 No Buzz costume is complete without the space toy’s wings. 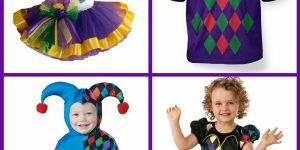 These particular wings are made from fun, colorful and vibrant polyester blends. What’s more, they even inflate so you can fly from infinity, and beyond. 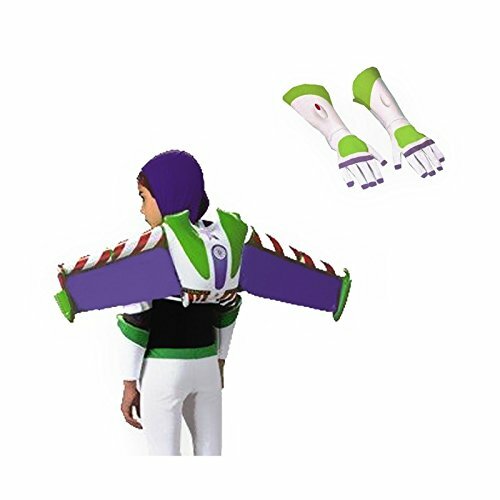 The Buzz Lightyear Jet Pack Costume Bundle Set comes complete with Lightyear’s jetpack and gloves. 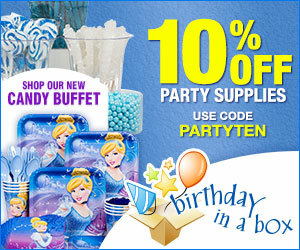 The set is perfect for playing dress up, parties, Halloween, trick or treating and my all-time favorite – pretend play. The jet pack features sturdy yet flexible wings that closely resemble the real thing. Buzz might be immune to the cold, but our kids sure aren’t. 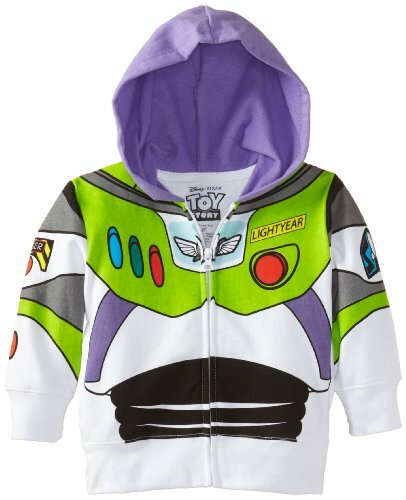 Keep the little ones warm and safe in the Disney Boys’ Buzz Lightyear Hoodie. Made from a cotton, polyester blend, this hooded jacket features a zippered front and all of Buzz’s buttons and highlights printed on. 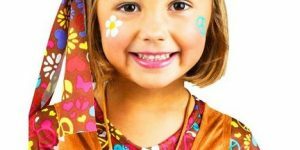 Hands up if your child is at the phase where they never want to take off their costumes? Just what I thought. 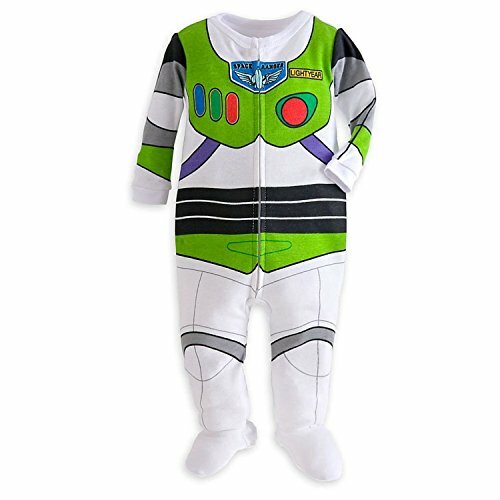 Well, now you can outsmart them and give them what they want at the same time with the Disney Buzz Lightyear Costume Footed Pajama. Also known as the yodeling cowgirl, Jessie is a brave, excitable and incredibly athletic character that first appeared in Toy Story 2 and 3. But while years of storage and abandon have made her somewhat withdrawn and afraid of the dark, she wants to overcome it and longs to be a source of joy to kids. After being stored up for years, it’s time to let Jessie out with the Jessie Deluxe Child Costume. The costume includes a vibrant jumpsuit with attached cuffs and belt. There’s also a hair bow included to snag that ponytail and Jessie’s red hat to match. 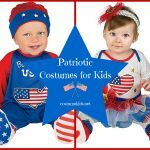 Comprising of 100% polyester construction, the Jesse Classic Child Costume is a fun, vibrant and great way to introduce your little ones to the world of role play. 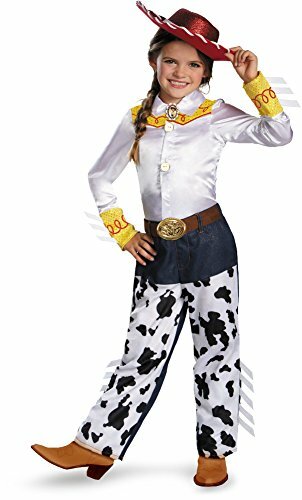 This licensed product is a one-piece jumpsuit with attached cow-print chaps and Jessie’s hat. Swapping her cowgirl chaps for a fancy, but equally snazzy skirt, the small girls Jessie costume is perfect for little princesses. 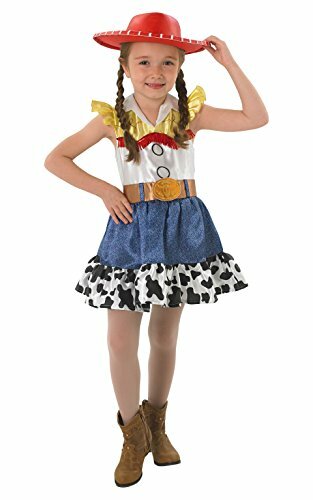 Costume includes a nice, cowgirl dress with cow-printed skirt and classic, red glitter hat. Introducing the most attractive costume of all, the Jessie Prestige Girls Costume is the real thing. It features a modernized version of Jessie’s shirt with incredibly detailed character cameo, a pair of fashionable pants with cow print and frills at the edges. The deep maroon hat with sparkles finishes off a fantastic look. Every story needs an army, and in Toy Story, that’s the Green Army Men. These Army Men are Andy’s 200 miniature plastic soldiers that are set in specific positions and stuck to their bases. However, this never slows them down. Led by Sarge, the soldiers are organized, disciplined professionals, masters of reconnaissance and will never leave a man behind. 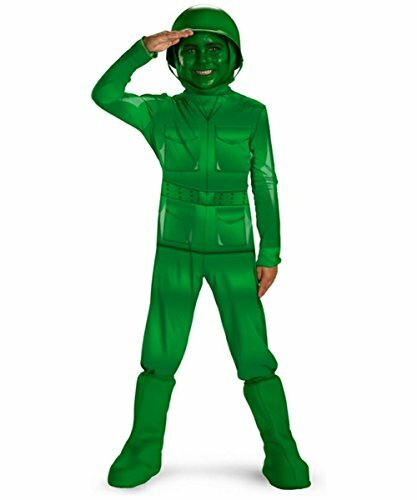 If your child is all about the file and rank, it’s time to give them purpose with the Green Army Man Deluxe Costume. 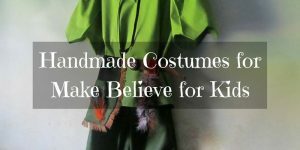 Costume includes a printed, green jumpsuit, hood, boot covers and hardy helmet to keep those small noggins safe. Introducing Sheriff Woody’s love interest in the Toy Story films, Bo Peep is a porcelain shepherdess figurine who’s always holding a long staff. Bo Peep and her numerous sheep are adornments of Molly’s bedside table. 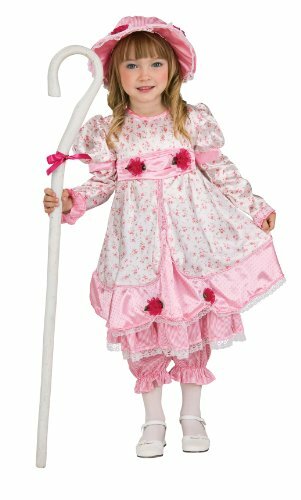 This cute and adorable white and pink floral dress comes with matching pantaloons and a bonnet that will ensure the loyalty of any nearby sheep. There’s also a light yet firm staff so your child can complete the Bo Peep image. The Aliens are three-eyed rubber squeak toys in the Toy Story franchise. With their three fingers, eyes, chubby bodies, short arms and legs, oblong heads, pointy ears and a single antennae, they all look and speak the same. Ready to explore distant alien planets? 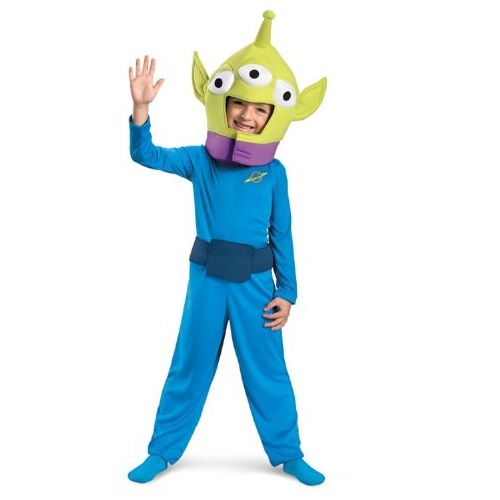 The Toy Story Alien Classic Toddler costume includes a blue, one piece jumpsuit with an attached alien belt and the character three-eyed headpiece with the typical pointy ears and single antennae. Rex is the large, clumsy and excitable green plastic Tyrannosaurus Rex in Toy Story 3. Rex suffers from an inferiority complex, anxiety, and the fear that he’s not scary enough. But in reality, Rex is just a sweet giant who is very sensitive in nature and dislikes confrontation. 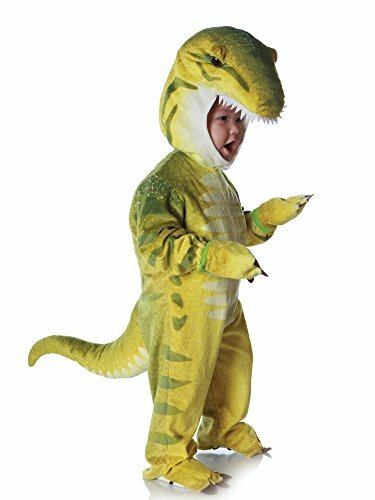 Introducing one of the most graphically detailed and accurate costumes on the list, the Underwraps Baby’s T-Rex is quite something to behold. 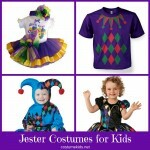 Costume is made from 100% light polyester with quite the vivid scale print design. The head and gloves are detachable for more convenience. 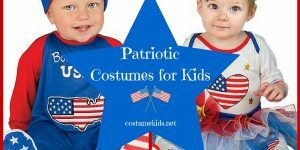 Your child will be able to reach for the sky and fly to infinity and beyond for many hours of make-believe in Toy Story costumes.